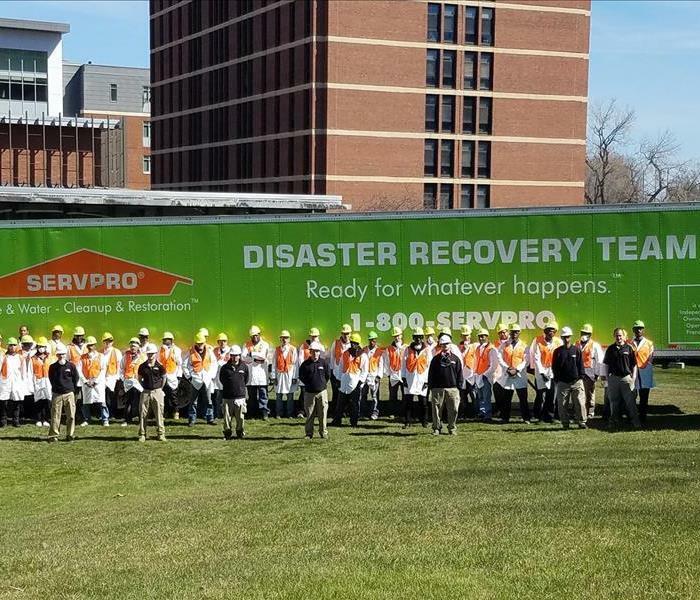 SERVPRO is proud to be the sponsor of the first-ever First Responder focused bowl game and we extend a heartfelt thank you to all the brave men and women on the front-lines. Their courage and compassion is inspiring to all. We are grateful to live in a country where individuals dedicate themselves to protecting and serving their fellow citizens. We are humbled by their bravery and thank them for putting their lives on the line in order to save those around them. We thank them for their service and sacrifice. The game will be played on December 26th,2018 at 12:30pm in the historic Cotton Bowl Stadium in Dallas, TX. And broadcast on ESPN. Water Damage in Pittsford NY - Customer had an ice damming on his roof and water leaked into his kitchen. This picture shows one of our many drying options, this is our wall drying system. This is a drying method known as 'tenting'. 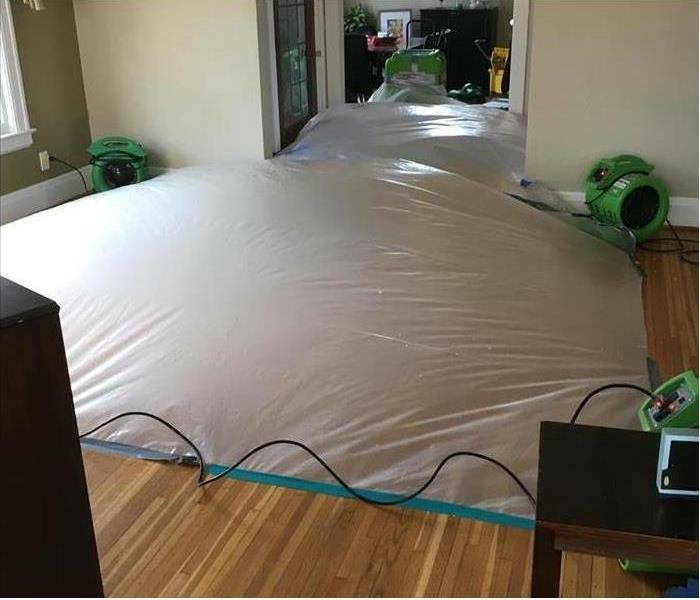 We created a drying chamber to dry out a hardwood floor affected by water damage. This also makes living conditions more comfortable for homeowners during the drying process. A local art gallery suffered a lot of smoke odor due to a fire at a building next door to it. We thermal fogged & set up 50 air scrubbers to help with odor. They were able to re-open in 2 days. This severe mold damage was caused by a pipe that had burst in the basement. Since our customers were on vacation, mold was able to breed and take over most of the house. 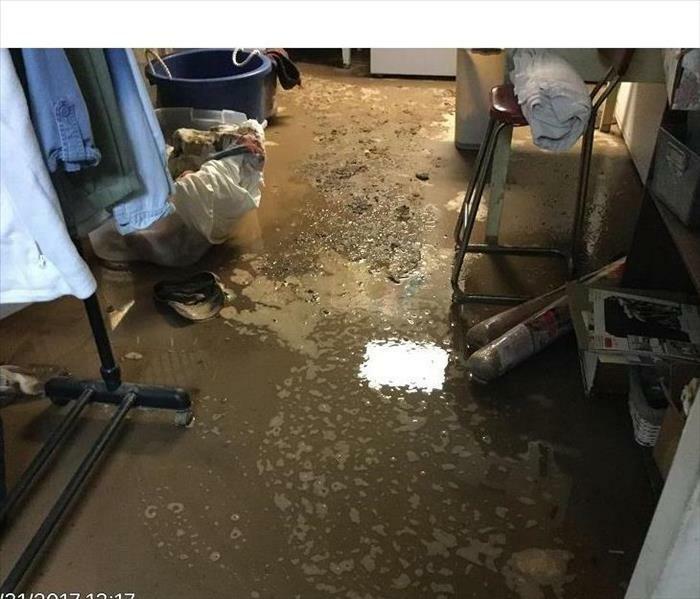 This flooded laundry room in Rochester, NY was the result of an overflow from a nearby lake due to a storm. 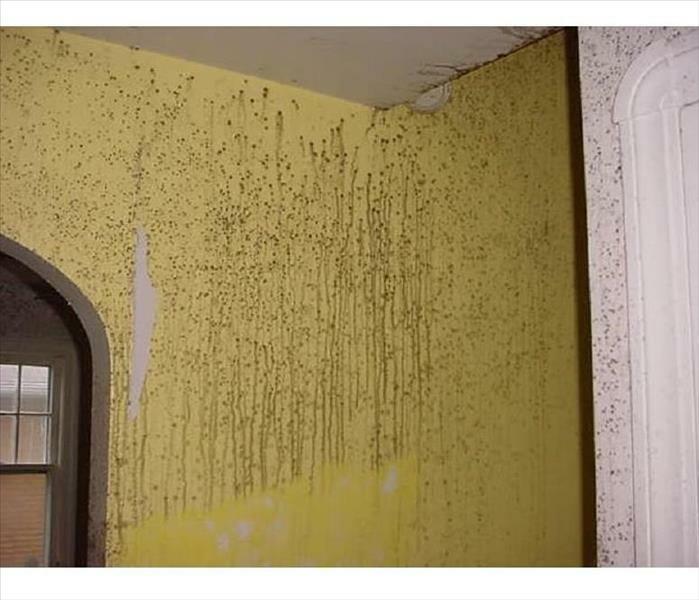 This picture depicts black mold along the walls of a Rochester basement. 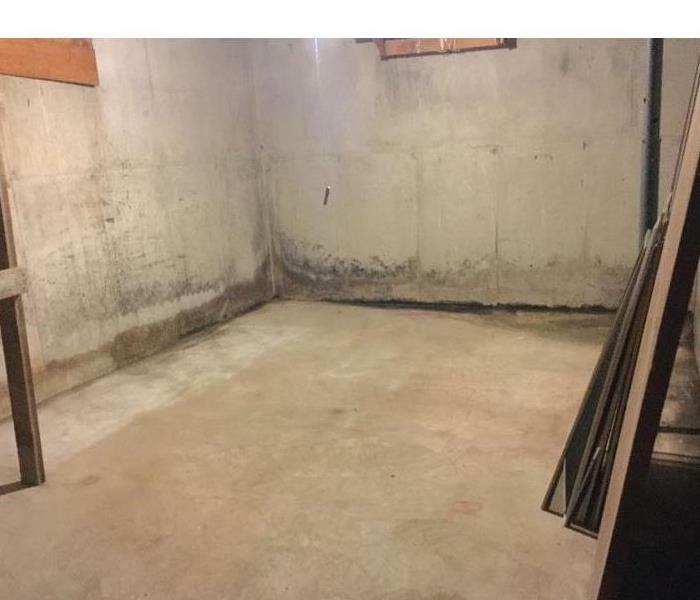 The mold was the result of lake flooding that had brought a good amount of water into this basement. 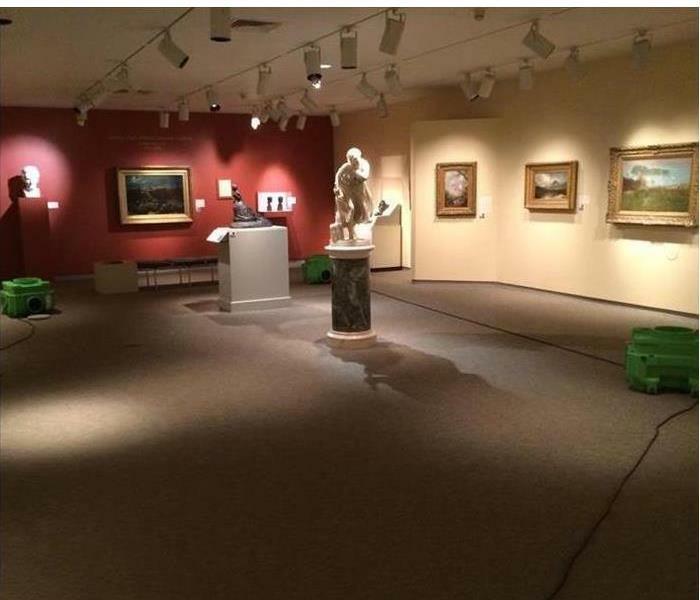 This water damage was the result of a broken pipe that flooded a local mechanic shop. 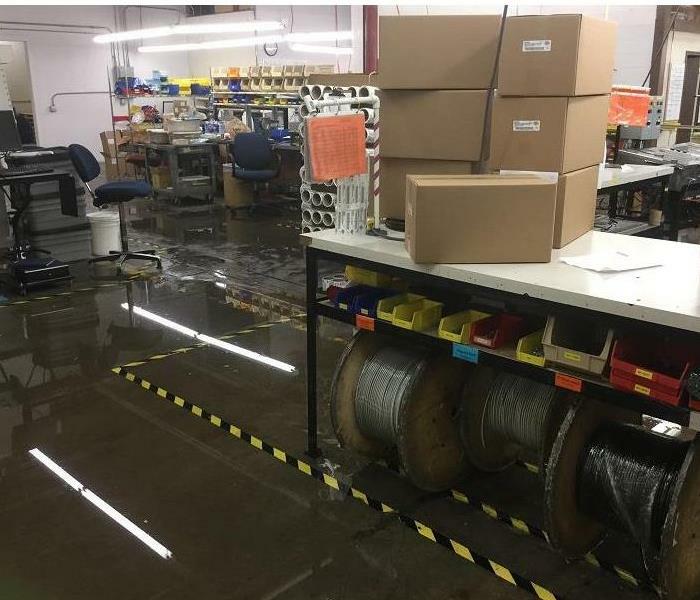 The water had traveled from the production room into the main office. 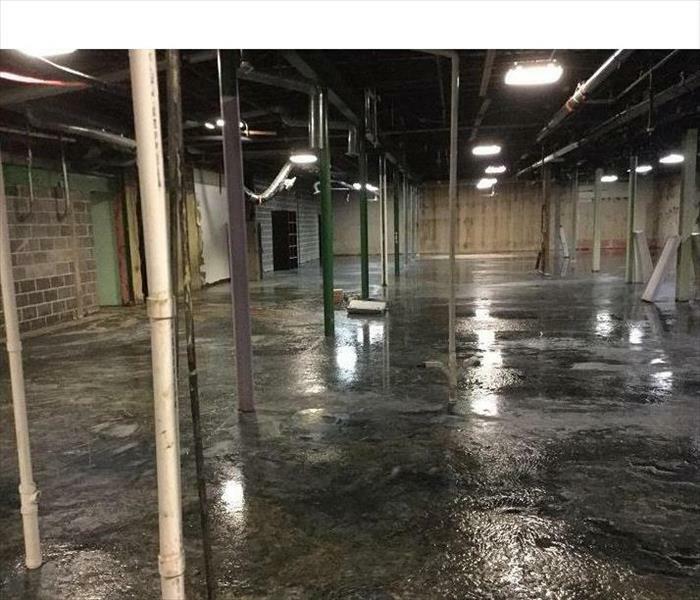 This water damage occurred because a toilet had backed-up overnight at a bowling alley. 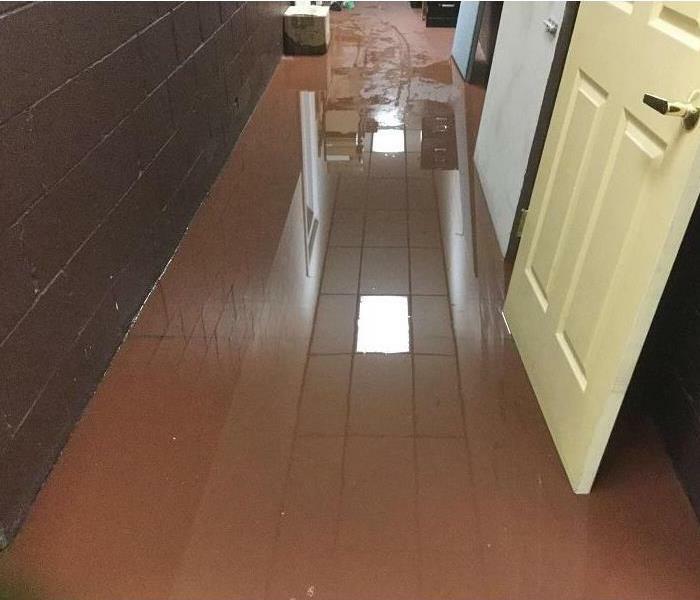 The water had gone through the hallway into several offices. A small leak in the ceiling of this apartment had gone unnoticed for quite some time. 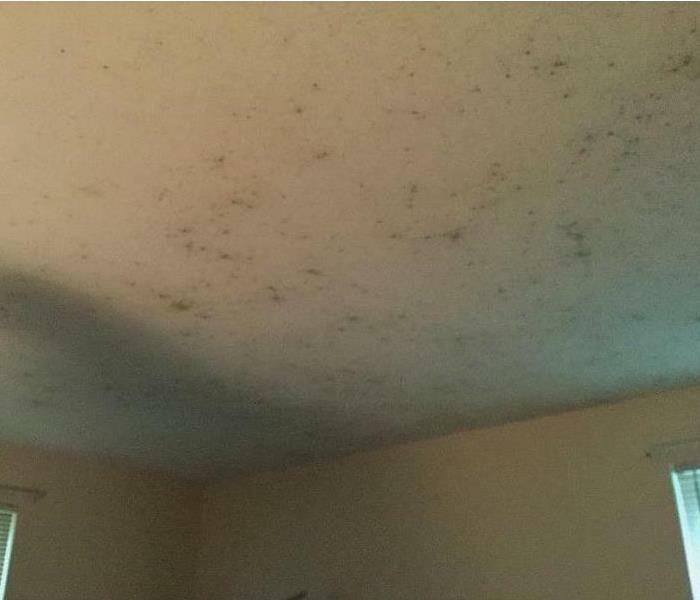 As a result, mold began to grow on the ceiling. 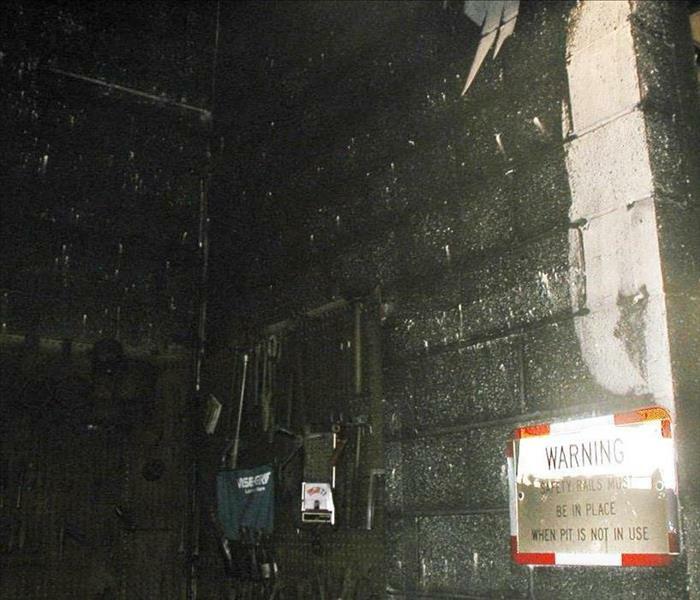 This basement had caught fire after the owner had been using a blow touch. 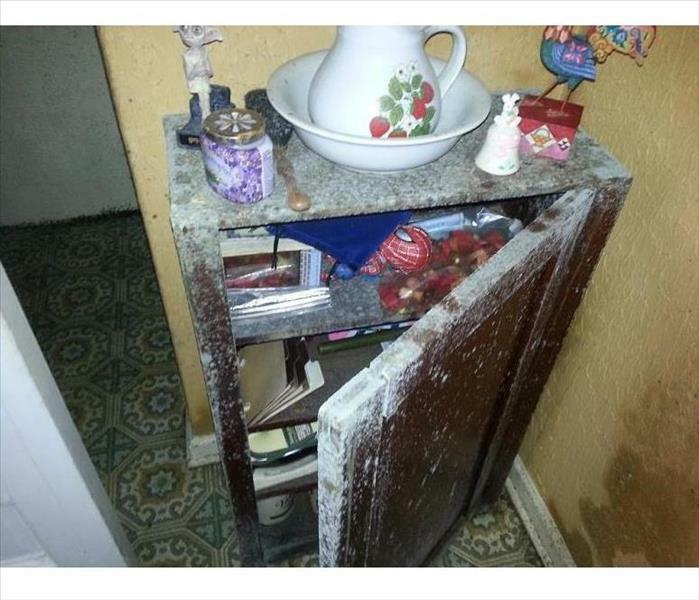 We were called to remove all damaged items. 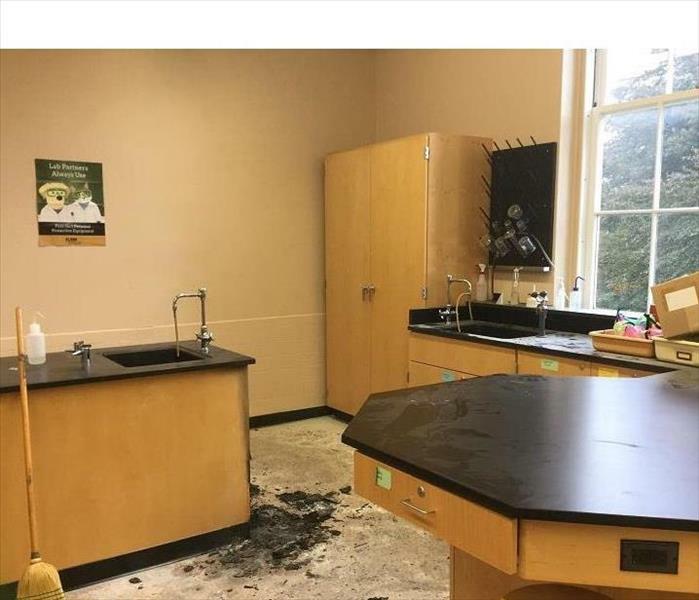 This biology laboratory experience a fire from a match that was thrown into the garbage pale. The fire was extinguished fairly quick. This picture is from an vacant space that used to be a gym. The sewage covered about 50,000 square feet of the affected building. Standing sewage was about 4 inches thick at its deepest point. 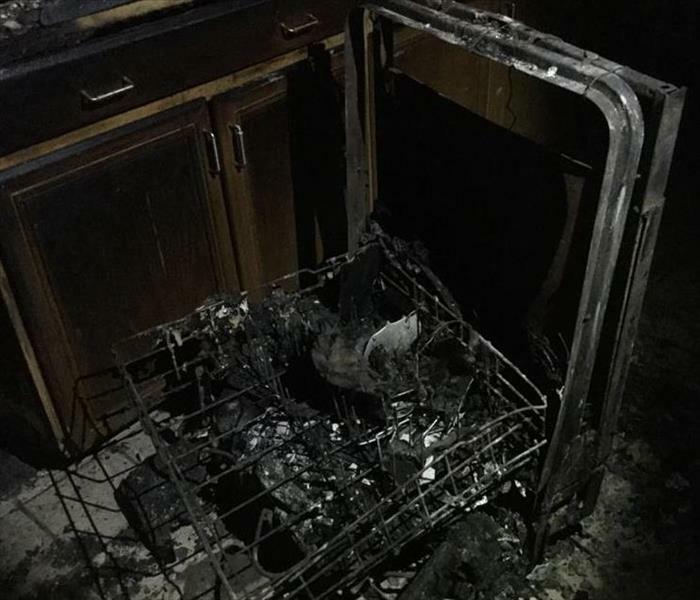 This kitchen in the Rochester, New York was the result of a fire that was caused from cooking food in the oven. 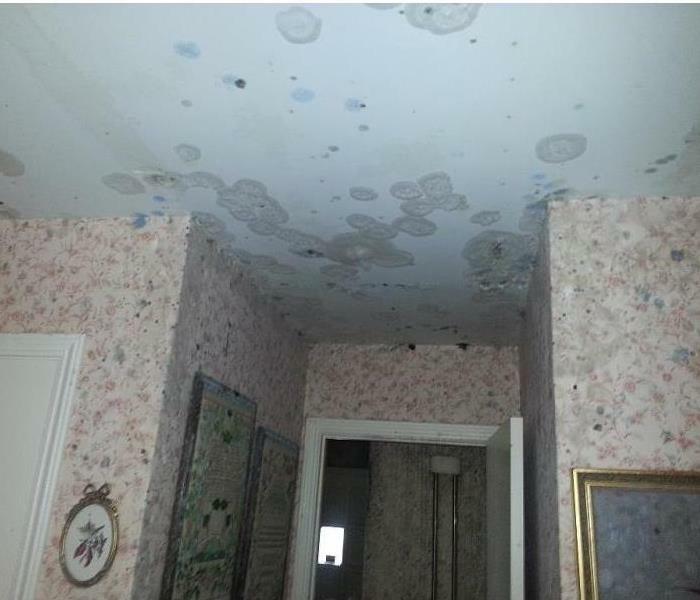 This picture is from a house that had been affected by extreme water damage. If you do not extract water and wet materials immediately, mold will begin to grow. In this case, the house was sitting for a long period of time without being dried, which allowed mold to take over this whole home. 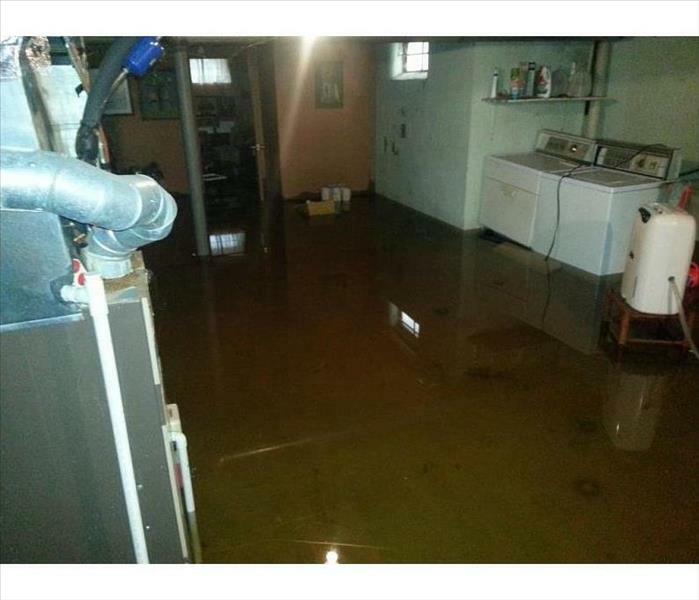 This basement in Rochester had a sump pump malfunction due to heavy rains from a storm. Since the water wasn't able to be pumped out it continued to fill the basement. SERVPRO of South East Monroe County were called to come extract the water. 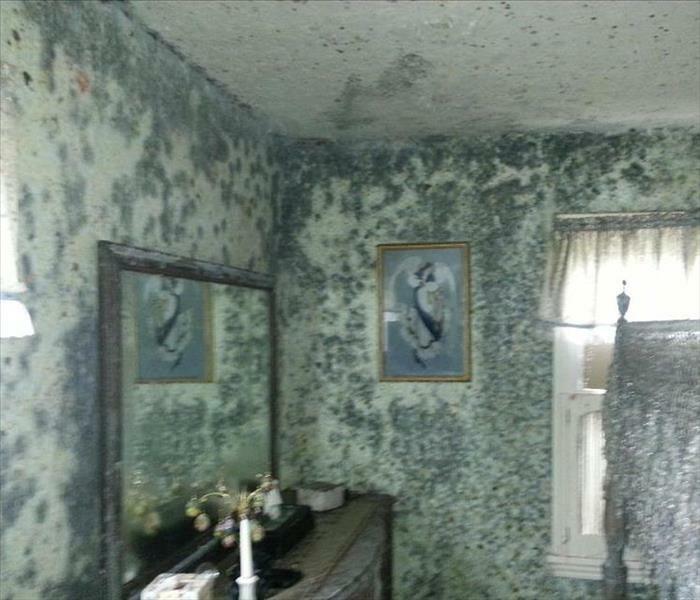 This picture came from a house that was completely covered in mold. 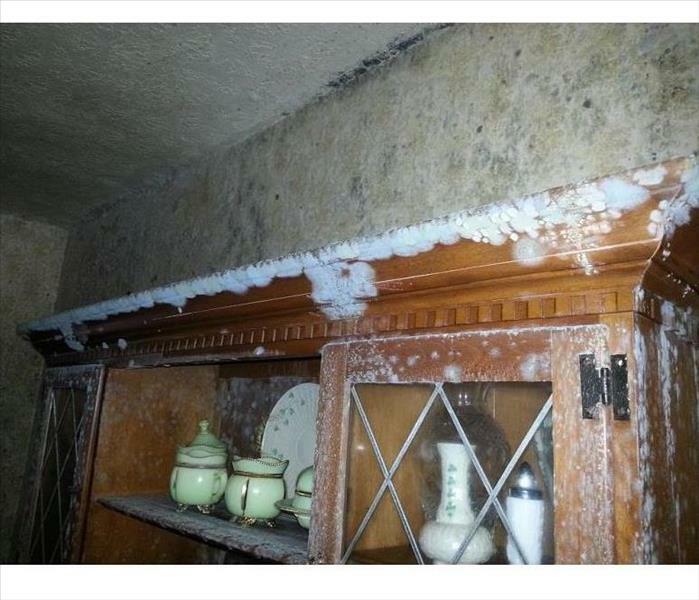 There was a water damage that went unnoticed for quite some time which allowed the mold to completely engulf this house. 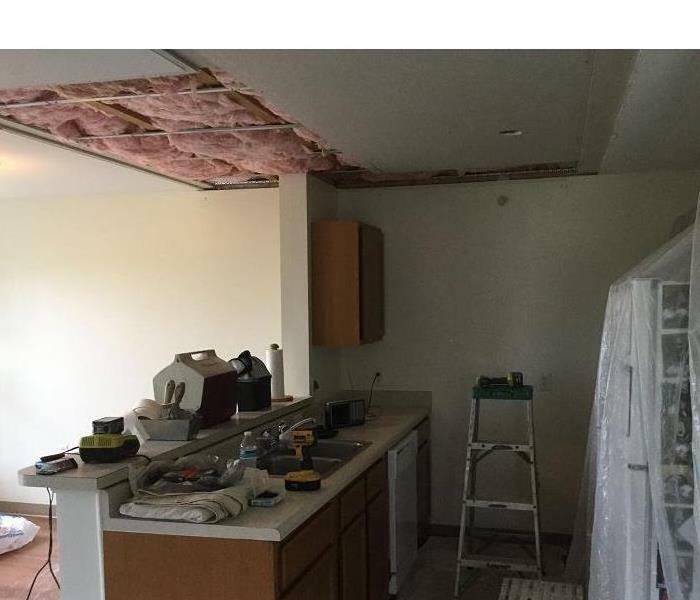 This picture depicts an apartment that experienced water damage due to a pipe break in the above apartment. 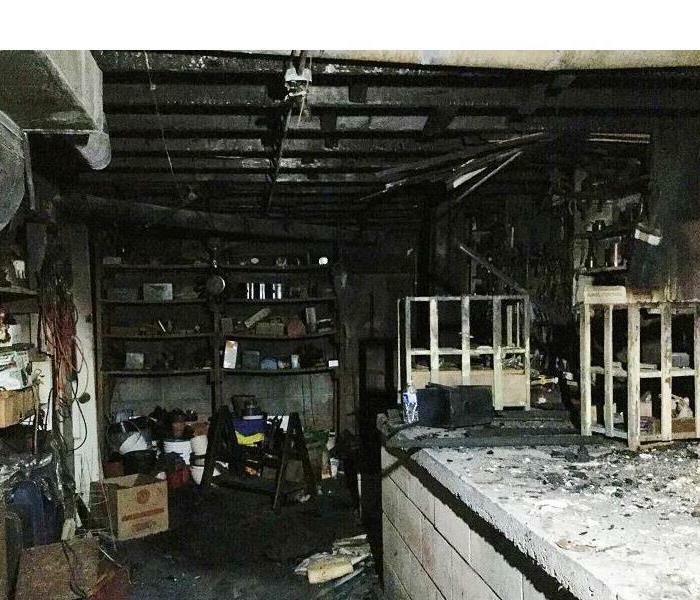 The ceiling and kitchen area were affected. Water is very destructive and usually brings down everything in its path. 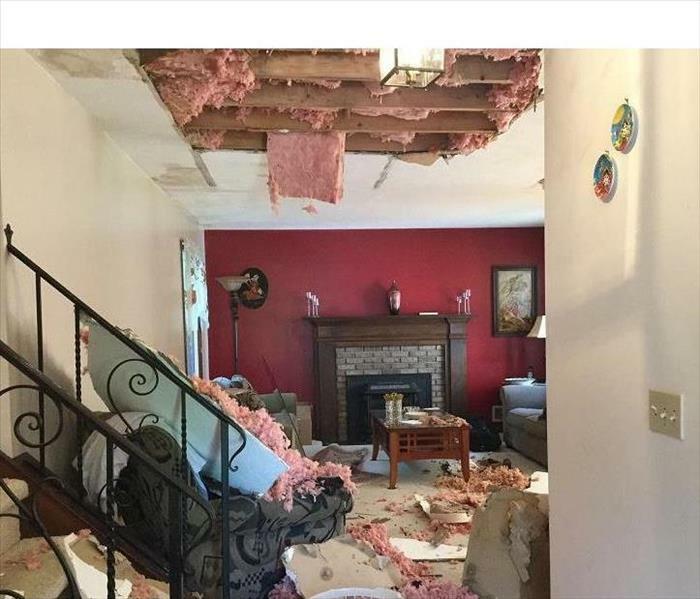 In this picture, the 2nd floor toilet overflowed and the water traveled to the 1st floor of the home and collapsed part of the living room ceiling. This picture depicts a home that has experienced roof damage due to a local Rochester Storm. The water entered through the roof and fell through the living room ceiling bringing with it insulation and sheetrock. Rochester Storm Ruin Your Roof? One of our many professional skills at SERVPRO of South East Monroe County is patching up your roof after a storm. 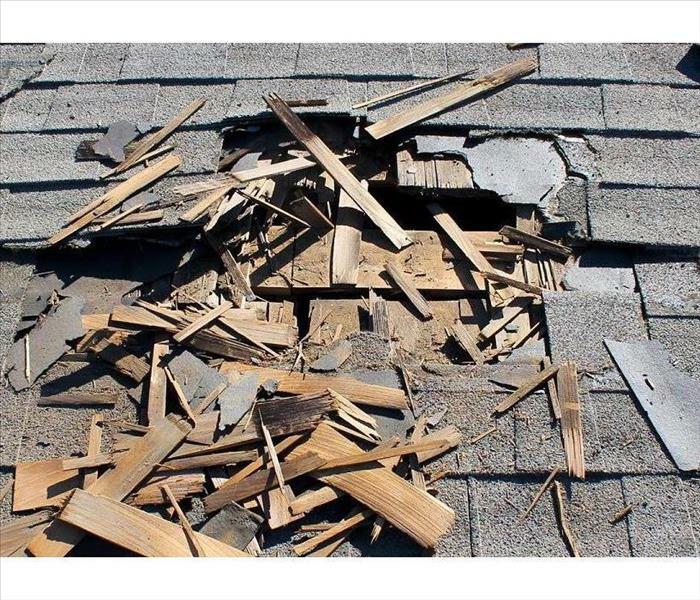 Sometimes debris flies around during a storm and cause damage to parts of your roof. The reason to call us for temporary roof coverage is so no rain water enters your house. Once rain water finds a way into your home, mold will start to grow and bigger problems will follow. Do you know what a puffback is? A puffback is an explosion inside the burner chamber of the furnace or boiler. Most puffbacks are small and are contained to the room where the explosion happens, but in some cases it sends soot and smoke through the whole establishment. Most puffbacks occur in oil-fired heating systems. In a furnace or boiler fueled with gas, the explosion is usually bigger and more damaging. Yes, we even save your stuffed animals! 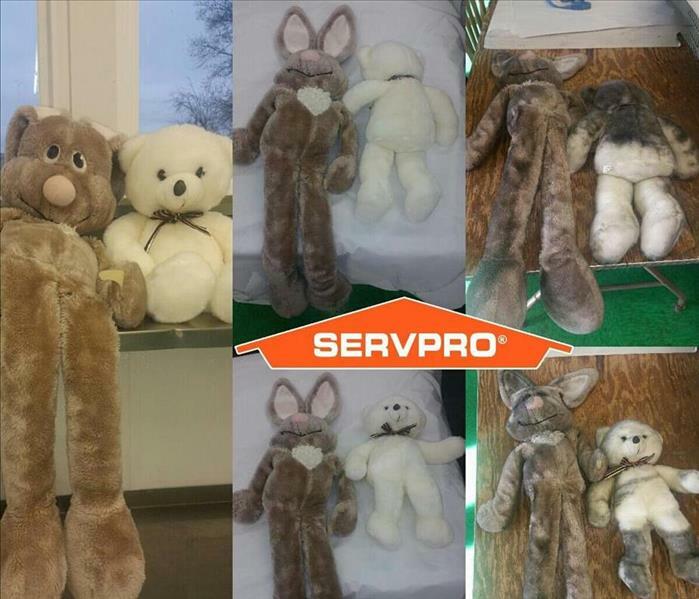 Here at SERVPRO of South East Monroe County, no item is left behind. Whether it be you children's stuffed animals or your good china that your grandmother gave to you. We treat all of your belongings with the utmost care, like it was our own. Even though a stuffed animal doesn't seem like something you should save from a fire, we know it carries with it sentimental value that is irreplaceable to you child. We know what our customers go through when experiencing a fire, and we want them to be as comfortable as can be. Knowing that their sentimental items will be treated with care truly gives our customers piece of mind. Soda blasting is a process in which sodium bicarbonate is applied against a surface using compressed air. 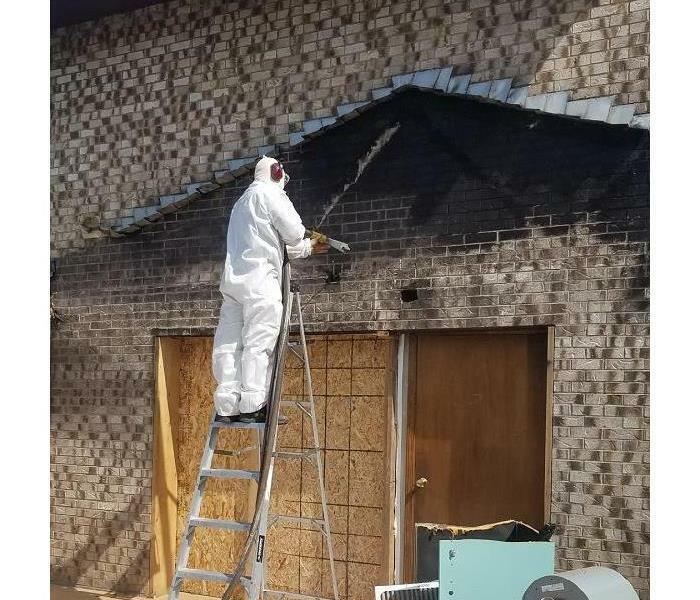 Soda blasting is a non-destructive method for many applications in cleaning, paint & varnish stripping, automotive restoration, industrial equipment maintenance, rust removal, graffiti removal, oil removal, soot remediation and much more. 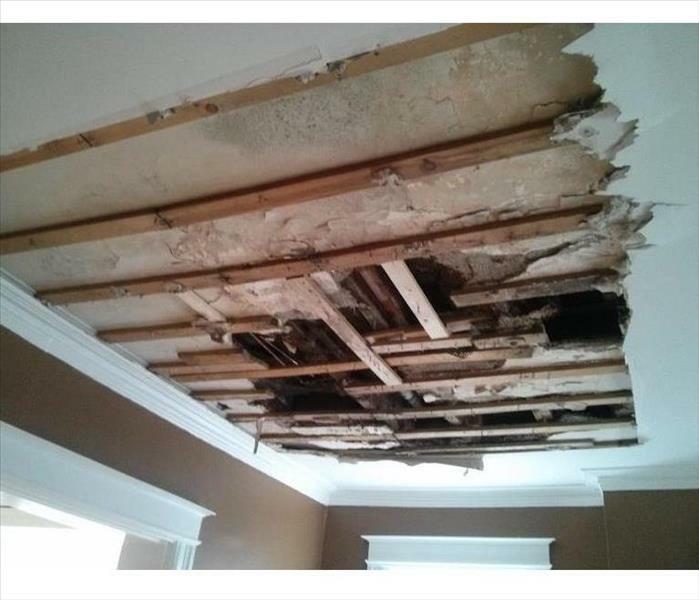 This picture depicts a house that unfortunately experienced a pipe break. Since the owners were on vacation at the time of the break, the water sat in the house for about 5 days without any remediation. The longer your house sits in water, the longer time mold has to grow an spread. Sometimes a storm can be bad enough to throw debris around and that debris could cause damage to your house. In this case, our customers roof was damaged by a tree branch that broke a hole into it. 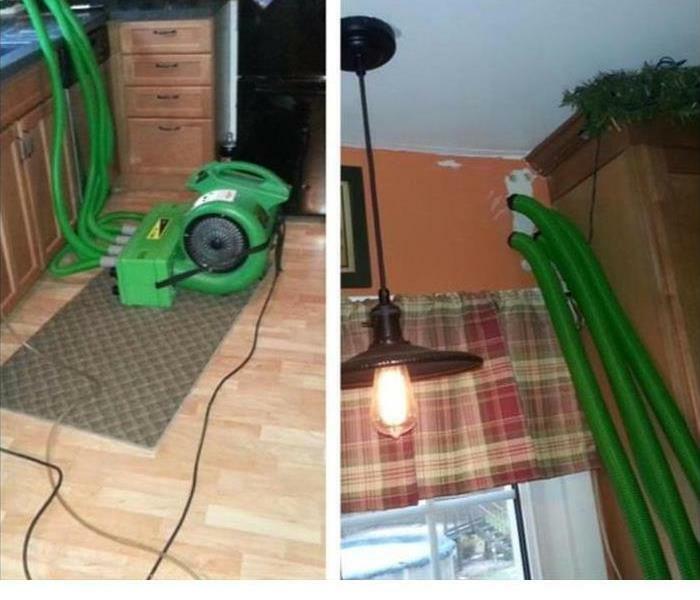 SERVPRO of S.E. Monroe County was called to professionally tarp the roof to prevent further water damage. We get calls for mold EVERY day. Normally its very minor issues always in the attic or basement. This was an abnormal situation where the house sat empty for a long time with no power, therefore the sump pump was not running and standing water in the basement created mold throughout the home. We are ready for any size disaster! This year we, as well as another SERVPRO Franchise, were able to help a local school with a clean up that lasted almost an entire month. The school was overly thrilled with our response time, and eagerness to help with whatever they needed for as long as they needed. Big or small, one call cleans them all! 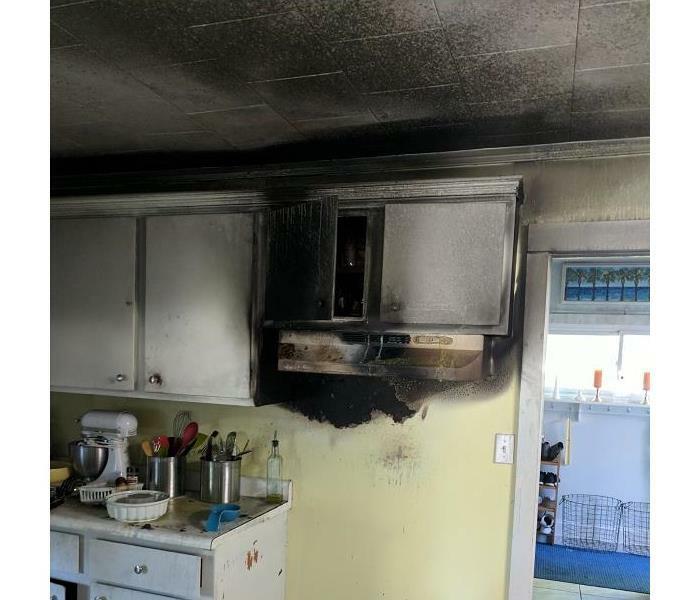 This was a bad kitchen fire due to an electrical issue with the dishwasher in Webster. The house will need a lot of repair work but in the mean time we packed out and are now storing the customer's contents until they are ready to move back in. 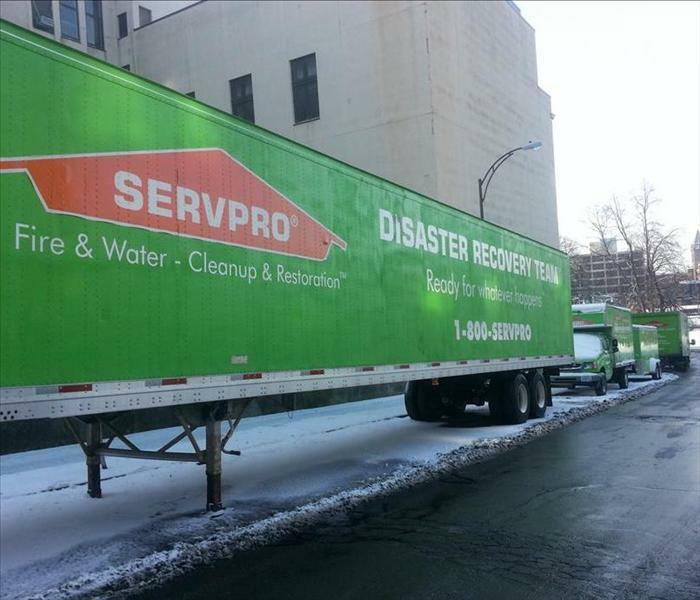 We received a call for a 19 floor High Rise Apartment Building Water Damage in Rochester, NY. We were able to utilize a Large Loss Response Team to assist us. Faster to ANY size disaster!